If you are taking a coaching approach to management (and I hope that you are), your job isn’t to try to “fix” or “improve” your employees. They don’t need to be fixed, and attempting to improve their weaknesses will leave you both frustrated. Instead, your job is to learn where they want to go, and then help them get there in the right form, and at the right time, for your team. Have you ever had to motivate a negative employee? How did you do it? Have you ever been the negative employee that needed some motivation? Extremely timely and relevant. It’s no wonder with a Bachelor Degree in Business Admin & Master Degree in Positive Psychology; I’ve found myself drawn and intrigued with a career in talent development and coaching. Planned a Vision Boarding team event for tomorrow. However the team failed to clear their calendar even with several weeks notice and so many could not attend, resulting in cancellation of the event altogether. Possibly not the right form or the right time? Something to think about. You’re a good person but you’re in the wrong job and because I do care about you I’m going to move you out of the team. Well said, love your work Marcus. I love this different take on addressing a chronically negative employee! Great advice, thank you! I needed this! I’ll use this conversation first with myself. Thank you. I love that idea. 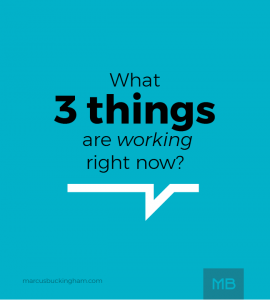 Especially when we are our harshest critics, taking a moment to ask “what’s working?” can change your entire outlook! How I motivate Negative people is satisfied there ego needs like they being right and make them important.. THANK YOU for having such concrete answer to one of the most common but ignored questions. Instead of how to motivate, we go back to relook at the role as a manager/teamlead. Oftentimes we are the cause of the negativity with the drive.drive.drive, not the person. By asking what would work for you right now AND LISTEN, it is really the best trust-rebuilding process. So again, thank you! Thanks for sharing such an informative article about the motivation. I got a lot of points.